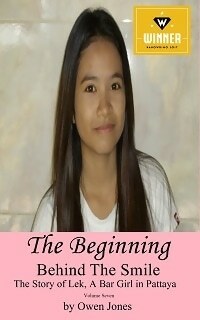 ‘Behind The Smile: the story of Lek, a Thai bar girl in Pattaya’ is the first novel of a new author. It became available on April 19th. 2012. Behind the Smile is a book that Mr. Jones says he has been trying to write for several years. It is set in Thailand, but the sort of people involved are to be discovered in most countries in the world. The story is not an atypical one in richer as well as poorer countries: a young woman gets married but her husband soon realizes that he is too young to become tied to one woman and live a life of drudgery. He begins carousing and sleeping around. His wife, not being prepared to put up with this, separates from him. The difficulty arises in Third World countries that people have no social security to fall back on, which is why family ties are so all vital. You could easily die without the support of your family. This normally works well, but not always. In Lek’s case her father dies at an early age and leaves enormous debts to the bank with the farm as security. The future looks bleak as Lek’s mother cannot do more than she is already doing. Lek could begin to help out, but a farm girl’s wages are low. One brother is already working, but the other is too young. At a family conference, they unwillingly make a decision that there is no option but to send Lek away to a big city to work, where she will at least be able to pay the bank’s repayment installments off every month. Lek goes to Pattaya where a relative owns a small bar. She is given a job as a waitress and she loves the thrill of the job. The dazzling lights, deafening music and attentive men are new to her. A month or so later, she realizes that she is pregnant with her ex-husband’s child. That is a total disaster, because it threatens her capacity to pay off the bank, which would bankrupt her mother and siblings. This book, ‘Behind The Smile’, looks at Lek’s life from her own standpoint and follows her through her fun and frustrations. It tries to demonstrate her thought processes and tell you, the reader, why she does things and what she may rather be doing instead. The title of the book, ‘Behind the Smile’, derives from the fact that Thailand is famous as The Land of Smiles. Owen C Jones has just published his first book which is entitled Behind The Smile: the story of Lek, a Thai bar girl in Pattaya, Thailand.